Japanese automaker Suzuki Motor Corp has unveiled the all-new facelift version of its popular hatchback Swift at the ongoing 87th Geneva International Motor Show in Switzerland. The much awaited third generation Swift will be a full model change with its development being focussed on achieving an innovative styling and agile driving performance, based the adoption of new-generation “HEARTECT” platform which is extremely light weight but rigid. Expected to hit the Indian roads early next year, the revamped Swift comes with a long list of updated features and styling. The car inherits the styling that speaks 'Swift' but the overall design has been revamped to look sharper when compared to the previous model that had round edges. Resting on the new platform "HEARTECT" the car has shed 120 kilos and will also be agiler and 5% more fuel efficient than the previous model. Measuring 3,840 mm in length, 1,695 mm in width and 1,525 mm in height, with a wheelbase of 2,450 mm it accentuates the Swift's low and wide form factor. The design features a large hexagonal front grill, a floating roof design, halogen fog lamps, 16-inch aluminum alloy rims with a diamond cut finish, sleek LED tail lamps, LED auto headlamps and LED DRLs, along with a revised rear bumper. Under the hood, the car gets two engine options- a smaller performance focused 1.0-litre turbocharged 3-cylinder BoosterJet petrol mill that kicks out 100 bhp of power and 150Nm of torque and a 1.2-litre Dualjet petrol engine producing 90bhp and 110Nm of torque. 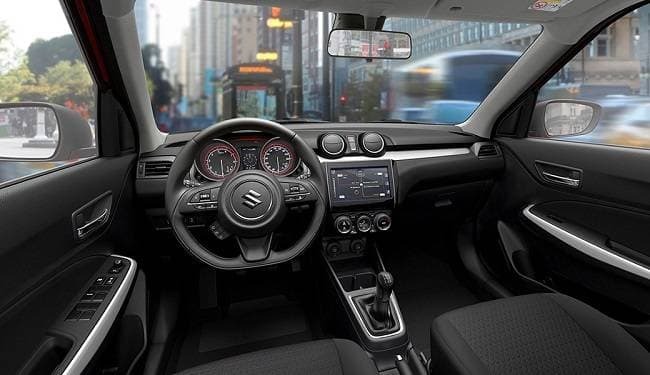 Inside, the cabin is now sportier and sharper with a young appeal thanks to the simpler race-inspired twin-pod instrument cluster and the new touchscreen infotainment unit with Apple CarPlay and Android Auto. 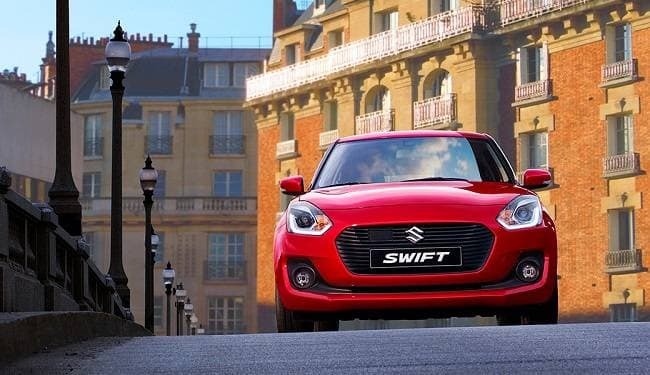 With over 5.4 million units sold globally out of which 1.5 million units are in India, Suzuki Swift has been the hatchback segment leader and has dominated the Indian market for years. It is expected to hit the Indian showrooms early 2018, with a price tag of around Rs 5.50 lacs.